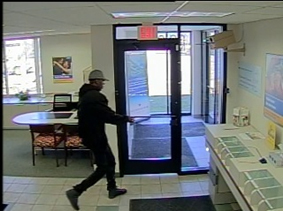 Kalamazoo, MI: On March 25th, 2019, Kalamazoo Public Safety responded to the 3200 block of Portage Rd, Old National Bank, on a report of a Robbery in progress. The employees advised an African American male, in his late 40’s early 50’s, entered the bank at approximately 1326, demanding money from the teller. 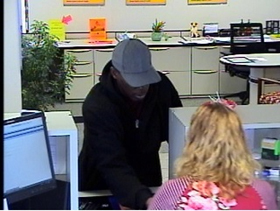 The suspect was wearing a black hooded zip up jacket, dark colored pants and shoes, and light colored ball cap. A gun was not seen, but he insinuated he had a gun. 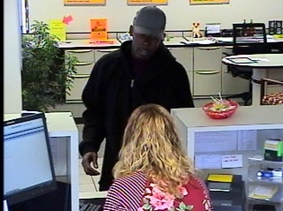 He fled the bank on foot after grabbing an undisclosed amount of cash from the teller. Officers arrived on scene shortly after the 911 call. A witness watched as a black male ran around the east end of the bank, through the parking lot, heading south and out of sight. Another witness observed the suspect jump into a small passenger vehicle, missing a front passenger hubcap on Howland Ave. The vehicle left west down Howland Ave, then north on Portage Rd. Kalamazoo Public Safety Patrol, Criminal Investigations Division, and Forensic Lab are working in conjunction with the FBI in attempts to identify the suspects in this case. 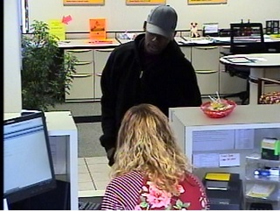 Attached are photos showing the suspect inside the bank during the robbery. Anyone with information regarding this incident is asked to contact Kalamazoo Public Safety at 269-488-8911, or Silent Observer at 269-343-2100. Kalamazoo, MI: On 03-24-19 at approximately 6:06 pm KDPS Officers responded to the 700 Blk of N. Pitcher St. in reference to a fight complaint, where multiple subjects were present with handguns. Upon arrival officers encountered a large group of individuals and preliminary information was obtained that two subjects with firearms ran into one of the houses. During this time officers observed another male running from the area between houses. This male a 31 year old Kalamazoo resident was contacted by KDPS officers and a handgun was found discarded along this male’s path of travel. KDPS officers continued their investigation at the residence where the other two subjects were observed running into by witnesses. From this investigation another 31 year old Kalamazoo resident was arrested for Felonious Assault-Firearm and two handguns believed to be used in this incident were recovered from inside the residence. KDPS found that this fight erupted between neighbors during a birthday party that was being held at the involved resident’s house and escalated to the point that firearms were pulled out and pointed at individuals, no shots were fired. Numerous children were present during this altercation.